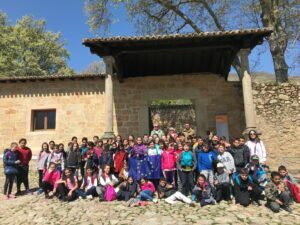 More than 200 primary 5 pupils from the schools of Talayuela and Navalmoral de la Mata visited the European and Ibero-American Academy of Yuste Foundation to attend a talk on European Construction, in addition to enjoy a visit to the Saint Jeronimo Royal Monastery of Yuste. The activity began on 13th March when 44 pupils from the school of Juan Güel de Talayuela listened to a talk given by the director of the foundation, Juan Carlos Moreno, on the history of Europe in the 20th century, European construction, the successive enlargements of the European Union and the EU’s current state with the Brexit. On Wednesday 19th March, the corresponding visits began in public schools in Navalmoral de la Mata. These visits which form part of the project titled ‘The European Union: A Long Road Towards Peace and Coexistence’, have been carried out by the Yuste Foundation together with local public schools, the Council of Navalmoral de la Mata and the Cepaim Foundation since 2017. The first of four schools to carry out the activity was El Pozón. The activity continued the next day in Almanzor and Sierra de Gredos, and concluded with a visit on Friday 22nd March to Campo Arañuelo. In total, around 156 pupils and 13 teachers attended the talk. The activity also has the collaboration of the Office of Extremadura in Brussels, as the delegate of the foundation in the European capital, Miguel Ángel Martín Ramos, gives one of the talks. The project that the foundation carries out with the schools in Navalmoral has different parts. The first part is the handing over of material by the European Commission, so that pupils have updated information of the European project. The next part involves Cepaim technicians in Navalmoral carrying out some group dynamics in school classrooms to work on the possible causes of migrations, and the difference with refugees, which is a way to look for possible solutions that can improve this situation. This is also the way how the development of skills, abilities and attitudes are worked on that allow laying the foundations of a supportive, participative, intercultural and democratic citizenship. Afterwards, the visit to the Royal Monastery of Yuste was organised, and the project concluded with the elaboration of a final group task in which the youngsters reflected on what they had learned with a special emphasis on the main reasons for the start of the European construction. Such reasons include the desire to end the frequent and bloody conflicts between neighbours which reached their peak in the Second World War, in order to build stable and long-lasting peace.